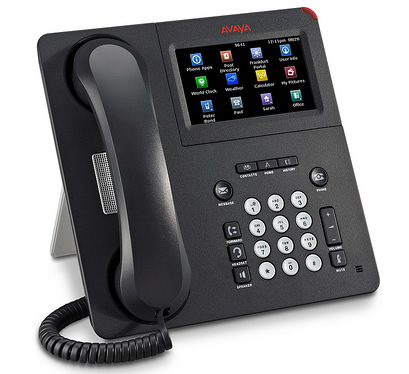 The 9641G features a Touch Screen Color Display (4.1" x 2.3"), Adjustable Tilt Display, Dual Gigabit Ethernet (10/100/1000), Configurable line appearance & feature key buttons, Speaker, Mute, Volume, Headset, Contacts, Home, History, Message, Forwarding & Phone buttons, and separate Volume for handset, speaker, ringer & headset. Supported by Avaya Communication Manager 3.1.4 or later (H.323). SIP version supported by Avaya Communication Manager 6.0 with Avaya Aura Session Manager 6.0 or Avaya Midsize Business Template 5.2.1.